Joe Satriani first toured Australia in 1988 as a hired gun on Mick Jagger’s Primitive Cool Tour. Two years later he returned fronting his instrumental trio, riding high after the explosive success of his second solo album, Surfing With The Alien and its follow up, Flying in a Blue Dream. By his own admission Satriani was finding his way as a front man at the time, drawing on the lessons learnt from Jagger and trying to translate them in the rarely chartered waters of the critically acclaimed and commercially successful rock instrumentalist. For people like me who saw that first Australian solo tour, the struggle was invisible. Satriani had emerged from the guitar hero excess of the ‘80s doing it on his own terms. He didn’t need a singer, the guitar was his voice and Satriani was creating his own language and vocabulary. And unlike many other shredders of the time, Satriani could write songs, with memorable melodies that penetrated commercial radio. Fast forward the best part of three decades and Satriani returns to our shores on the back of his 16th solo album, What Happens Next. Countless shows have shaped his stagecraft and he rules the stage, works the crowd and exudes joy and grateful humility. It’s hard to not like the guy. I caught the tour in Canberra’s beautiful Playhouse Theatre, filled to capacity with an enthusiastic crowd. The show kicked off with “Energy”, “Catbot” - the opening tracks from the new album - and a rousing “Satch Boogie”. After spending near on 12 months touring this show, the band was in excellent form. Bryan Beller on bass was his exuberant self, working the crowd and pulling off some amazing, whilst all too brief, solos. Joe Travers is the newest member of the touring clan, his drumming sitting firmly in the pocket all night, although he certainly chopped out during his unaccompanied solo. But it was longtime Satch collaborator, Mike Kenneally, who almost stole the show. The former Zappa and Vai sideman was on guitar and keys duty - astoundingly playing both at once several times during the two sets. On guitar Kenneally alternated between a Supro and a Strandberg - a curious mix of old and new school - whilst pummelling rhythms and wailing on some killer solos. His extended solo on the outro of “Super Funky Badass” ruled, whilst duels with his boss on a jam inflected “Ice 9” and hypnotic “What Happens Next” kept both the band and crowd on their toes. A highlight of the gig was the telepathic interplay and spontaneous jamming between the band members. At the close of a sublime “Flying in a Blue Dream” Satriani found the sweet spot between two of his six, yes six, wedges and embarked on a glorious feedback solo all the while followed by Kenneally and Co. “Summer Song” and “Surfing With The Alien” - unsurprisingly the final piece of the night - also featured extended and euphoric outro jams. Satriani has more than enough repertoire to pull of a greatest hits set, but refreshingly mixed a lot of new tracks with old favourites. Johnny and Santos “Sleepwalk” was a beautiful start to set two - set up by a sweet monologue from Joe on the song’s personal significance. “Cool No.9” and “Always With Me, Always With You” were crowd favorites and I couldn’t help but smile when Satriani launched the melodic tapping sequence in the latter. Overall, the show was paced perfectly. Longtime guitar tech Michael Manning got a shout out from Satriani, which for extra nerdy fans was very cool. Manning kept Joe supplied with a pair of JS2400 signature Ibanez guitars - one chrome and one red - for the majority of the night, and seeing the spotlight reflect from ‘chromeboy’ back into the crowd was a unique and quirky addition to the visuals. Manning’s only break in this routine occured when handing over a custom painted blue Ibanez for another new tune, “Cherry Blossom”. From my vantage point - and certainly aurally - this guitar seemed to bring a more traditional S-type vibe to the rig. Three signature Marshall half-stacks dominated the back line on Satriani’s stage right position. To watch and hear Satriani wring his now signature tones from the guitar in a live setting is a joy to behold, even for the most ardent fan. Unfortunately, Satriani’s guitar dominated the mix to such an extent that it became fatiguing to strain to hear the other band members clearly. I realise the guitar is the principal voice, but hearing Satriani’s otherworldly melodies so detached from from the harmonic content they hang from was disappointing and at times, painful. That said, the euphoria of seeing a well loved artist with a killer band spreading good vibes and musicianship far outweighed any negatives and I’m pretty sure the 1,200 people I shared the room with would agree. 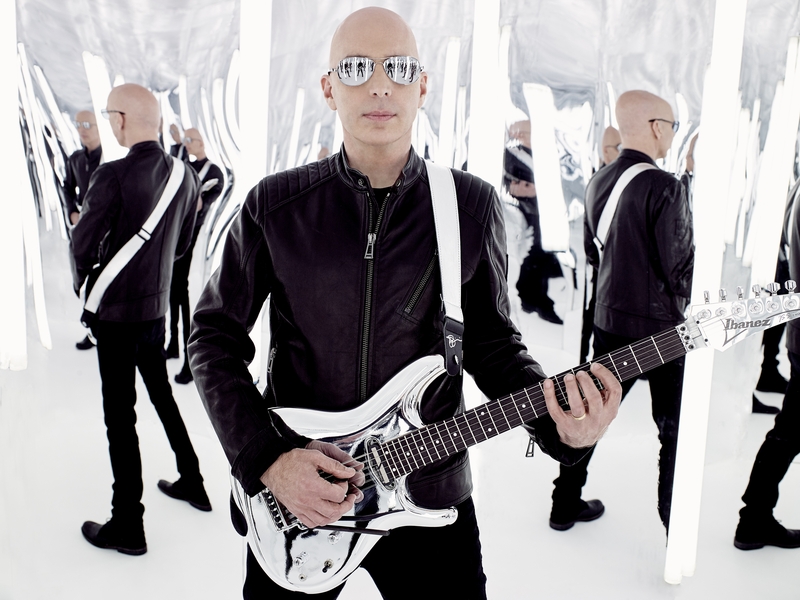 Satriani’s tour moves to New Zealand shortly, but I doubt this Australian trip will be his last. Matt’s ‘Tone and Sound - Gear Guide’ blogs for jam.buzz have also looked at the rigs used by John Mayer, Jimmy Herring, Trey Anastasio, Marcus King, Phil Lesh, Eric Krasno and Warren Haynes.